Judy has so much to do sightseeing, driving and all that she assigned the media task to me. 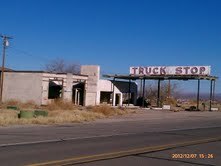 If I remember correctly Judy left you in anticipation of visiting, Bisbee, Tombstone and Boothill. 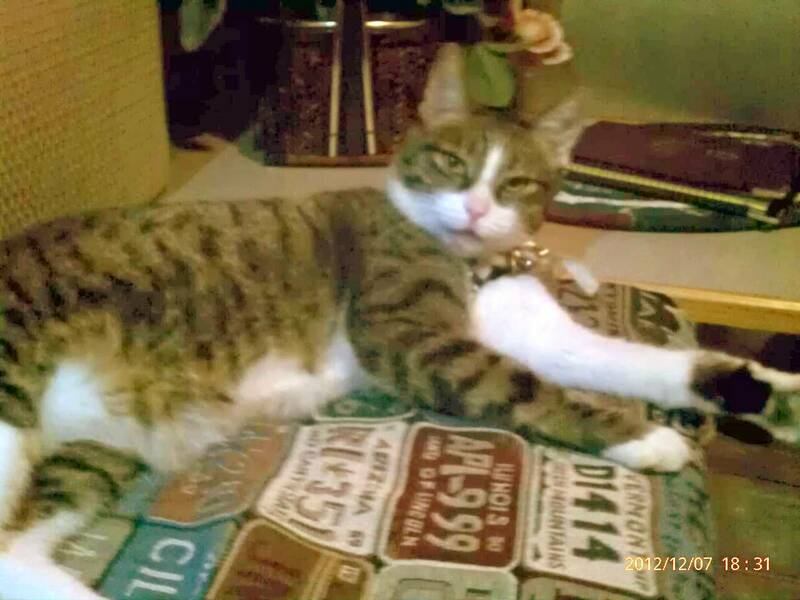 If I were to report the days' events from my point of view, it would only be I pondered the universe and its relationship to me for hours in cat meditation until Judy returned from a full day of sightseeing. 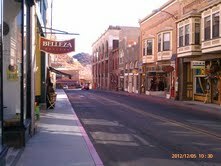 Judy and Vicki arrived at Bisbee early and checked out the town. 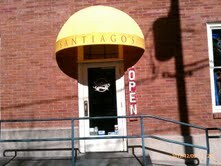 She marveled at the architecture and visited with shop owners who recommended a great Mexican restaurant called Santiago’s for lunch which had great Chicken Mole. When she returned home I batted around a catnip toy, the result of her morning shopping. It was a nice bit of recreation to work out the kinks of the day’s heavy meditation. 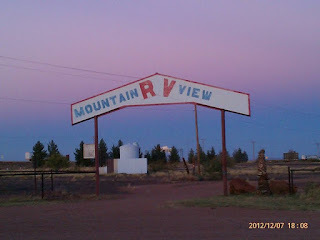 Judy raved about Tombstone with its friendly residents and shop owners who charmed her with historical stories. Although we’ve toured “the town too tough to die” before, Judy never visited the “World’s Largest Rose Bush Tree,” sent from Scotland and planted in the spring of 1885 by the Macias family. 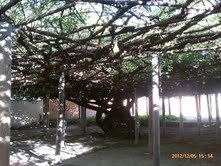 The unbelievable pictures made my paws itch to climb through its myriad of branches. The adobe inn encompassing the patio where the Lady Banksia Rose Tree thrives was one of the first structures built in Tombstone. In 1935 the Macias family changed the name of the adobe structure from the Arcade to The Rose Tree Inn and has continually tended the rose bush for four generations. Every author who has visited Tombstone has found his or her way to the inn, not only for the fine accommodations, but to seek out Mrs. Macia’s vast knowledge of the area’s history. 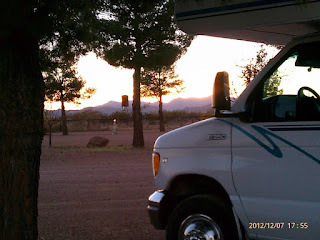 That night we packed up for a day of traveling in the southwestern sunshine. 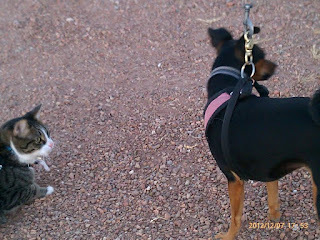 Deming was our next stop at an SKP (Escapee) Park, Rovers Roost in Casa Grande, Arizona. The first night was free if we boondocked so Judy counted on me to keep her warm if the night turned too chilly. 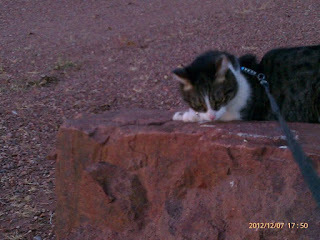 Vicki had a friend in the park who took us to dinner and in the morning we headed for Deming, New Mexico. 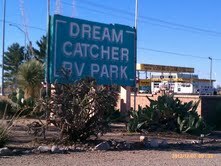 The Dream Catcher in Deming New Mexico was another SKP campground. Judy related the time she passed through eight years ago on her initial trip to Florida. Recently widowed, she recalled their friendliness with an invitation to the potluck that night. Even though she was not an Escapee member at the time she was touched by their kindness. Evidently it was just their way, because when she checked in this time, they offered free turkey soup, bread, and carrot cake. She returned to me that night with a contented smile from good food and good folks. She reminded me how traveling always introduced you to the nicest folks. She met a fellow at the dinner whom she met in Yuma in March. He was what we RVers call a snowbird, headed for San Diego to escape Michigan’s winter. The campground hosts talked of the rock hounding and loved the area so much they bought land in Deming. Judy says Rving is a great way to discover where you want to settle down when you retire. As a cat I have been retired all my life, that is why I don’t mind filling in like this for Judy when her schedule is too tight. The new owners of the park Sharon, Sue and their timid dog Shila were accommodating and eager to make their new adventure during their retirement years a success. After another beautiful sunset, morning found Tika and me discussing our route. Tika informed me that she and Vicki wanted to stop at an SKP park in Pecos which would cause them to veer sixty miles from our planned route. I told her Judy and I decided to stay on schedule and we could meet up in Hondo Texas. I sat for awhile reviewing our adventures and wondered what was in store next. Check out our books, COAST TO COAST WITH A CAT AND A GHOST and our newest, GOING HOME WITH A CAT AND A GHOST on Amazon. 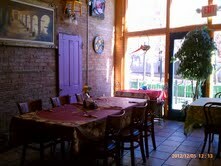 The best gift for the holidays or a birthday http://www.amazon.com/JUDY-HOWARD/e/B005H1KXYU/ref=ntt_dp_epwbk_0is a book. Great posts and pictures. I see you keep Sportster on a loose leash. Don't let go.